One of the beautiful things about the game of baseball is the way it can make you feel like a kid again. 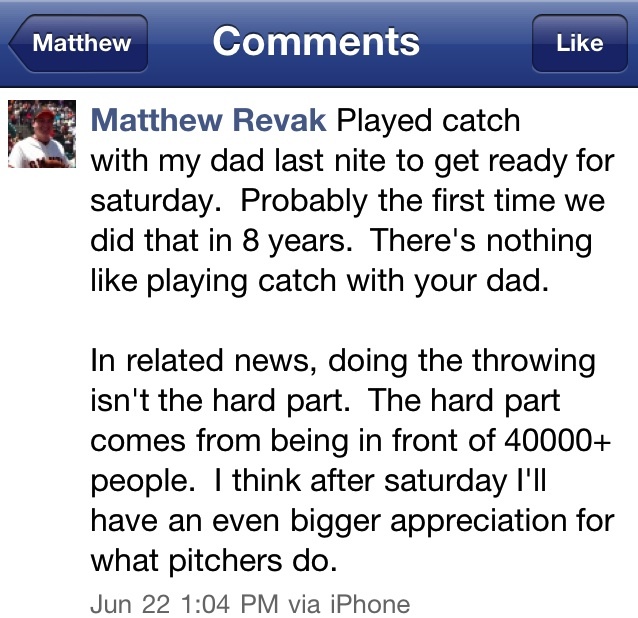 So many fans dream about getting that game winning hit, or striking out the last batter to win the World Series. There are the lucky few who work hard, but are also blessed with the talent to play the game in the Major Leagues, achieving their dreams. Then there are the rest of us: Those who go to games and cheer on our favorite players, living vicariously through them as if we were having the same moment. 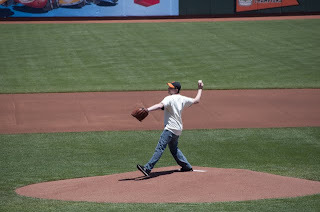 Recently I was able to have my own Major League moment; I was given the honor of throwing out the ceremonial first pitch before a San Francisco Giants game. You must contact me within 24 hours to claim this prize – by Monday, June 29th at 9:20am PST. Feel free to respond to this email. We were excited. 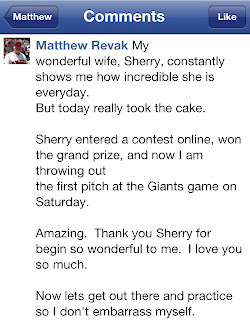 Sherry has incredible luck. She has won concert tickets, good chunks of change on slot machines, tickets to car shows, and even stuffed animals in the claw machines at pizza places. So, it was almost no surprise when she showed me that she had won this amazing prize. Second place in a random drawing is awesome, but it didn’t prepare us for the following day. “Of course, YES” I said. I was in shock. After she explained the situation and sent me the below email, I still couldn’t believe it. Please email me back within 24 hours to claim this prize (sooner the better so we can give you all the details). I could not stop thinking about it the rest of the day. I don’t think I was able to get any actual work done until a half hour before my workday was over. My phone kept ringing off the hook, and the reaction from my friends and family was overwhelming. Everyone was excited for me and kept giving me the obvious advice: “Don’t screw up”. Of course that didn’t help my anxiety about the pitch. My Dad was in shock himself. He kept asking me if it was all a scam! I think it felt too big; too amazing for any of us to really grasp. The following few days I worked my way towards the big moment. I played catch with my dad and my friends. I never played little league and I hadn’t thrown a baseball in years. I really needed to practice. I could not stop thinking about it. It didn’t keep me up at night, but when I wasn’t asleep, I was thinking about the pitch. I began to psych myself out and play out the entire event in my head. Thoughts of screwing up the throw looped in my mind. Then my thoughts would change for the positive and I’d fantasize about the crowd cheering and me imitating Sergio Romo’s “Point to the Sky” move as he comes off the mound. 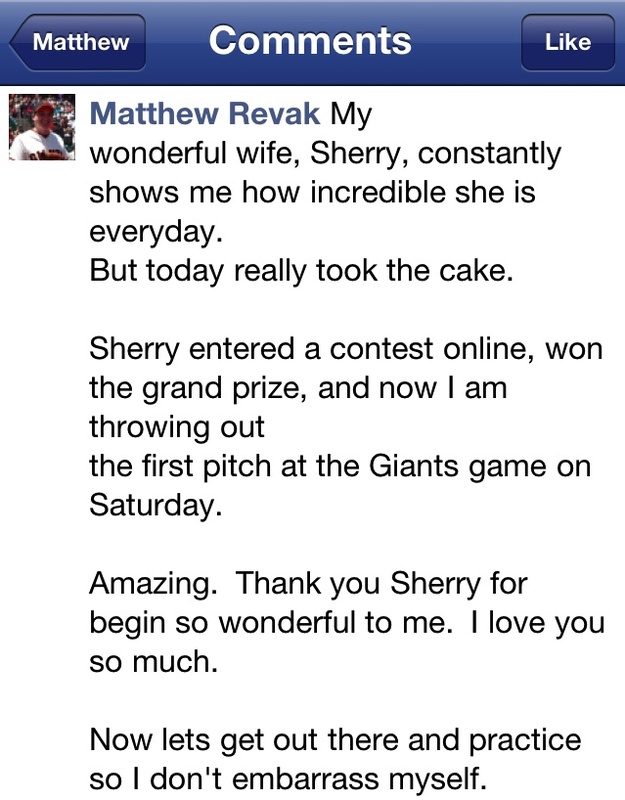 I then talked to Sherry and my Dad about how I was feeling. They told me not to worry about throwing the ball. Just play catch and enjoy the moment. It was then that I realized the weight of the situation. I was doing something The President does. This is a big deal. I should enjoy it and not stress out about it. The pitch will only take seconds, and if I do good or bad, I’m doing it. No matter what the result is, it is AWESOME. The big day was finally here. I was very excited and nervous. My parents, Sherry and I drove to the ballpark leaving plenty of time to get there before the game. We got our tickets from will call and met with the people from Wing Stop for a pregame party. We were treated to some SF Giants World Series Champs baseball caps, a copy of the current Giants Magazine, and lunch. I forced down a hot dog and a cookie (my favorite) to make sure I had something in my stomach. As the clock crept closer to the start of the game I grew more and more nervous. Mike Martin from the Giants PR team met up with us at the party to give us our field passes, hand me the first pitch ball, and to take us down to the field. He had enough passes for my wife and I, my parents, and even my sister and her boyfriend to come down to the field. We walked past the KNBR 680 Radio booth, through the hallways of AT&T Park, and down to the field. 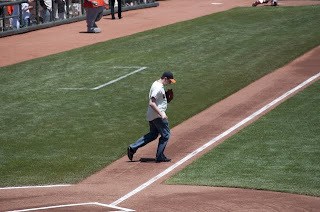 There I met with the photographer who gave me a few instructions and we stayed on the field for the National Anthem. Then we moved over to the Giant’s on deck circle where we waited for my turn to shine. Having been on the field for about 10 minutes now, I grew very comfortable with being in the most beautiful baseball cathedral in the game surrounded by a crowd of over 35,000 people. Lou Seal, the Giants Mascot, rode by on his scooter and I gave him a high five. A minute or so went by, and then walked over “my catcher” for the first pitch, Giants relief pitcher Sergio Romo. We shook hands and he asked me if I was going to throw a strike. I told him, “Just make me look good!”, and we were off. It was then that the dream became reality. I was walking onto the field where weeks ago legend Willie Mays was honored, and to top it off, during a game, in front of a huge crowd. I was acutely aware that some players could be watching from the dugout as well. This is a team comprised of players that as a kid and adult continue to be heroes of mine. I was about to have my Giant moment. Renel Brooks Moon, the Giants PA announcer began to speak. The image of me appeared on the JumboTron in centerfield. 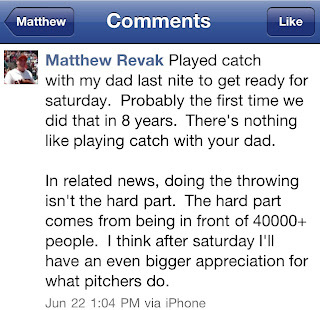 I kept thinking about the advice my Dad gave me while we played catch. 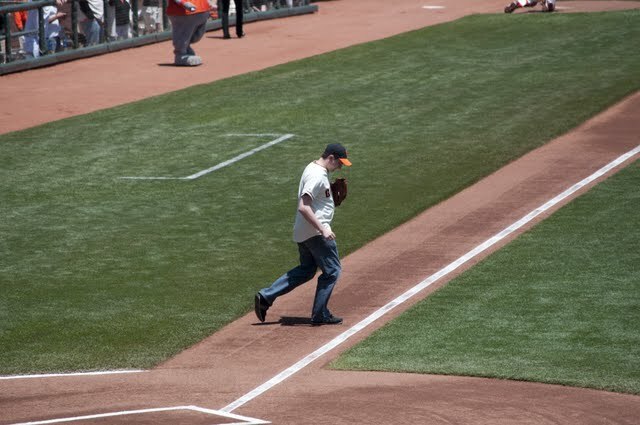 I walked up the dirt mound and for a brief second thought about switching out the first pitch ball for the game ball that was waiting on the rubber for Matt Cain. I took a deep breath, looked into the catcher, got the thumbs up from the photographer, and threw the ball. IT WAS AWESOME. IT WAS PERFECT. And well, depending on the umpire, IT WAS A STRIKE. Sergio came out from behind the plate, said I threw a strike and told me “Good job!” I then took a pen out of my back pocket and he signed the ball. I walked back to my family at the on-deck circle, receiving a multitude of high fives, handshakes and hugs all around. We started our journey back to the stands and up to our seats, and along the way strangers patted me on the back, high fived and told me good job. Even my 5th grade teacher, Mr. Hazatone, came to the game to watch me throw the first pitch. He came up to me in the stands and told me how great it was. I am incredibly honored that he came out to see me. 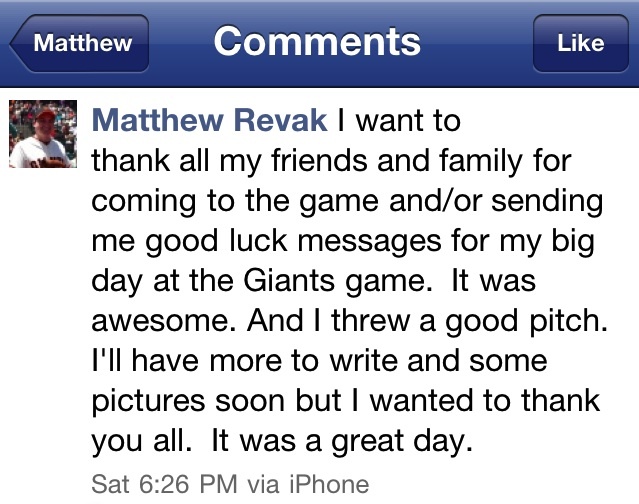 He remembered me as a little kid being a Giants fan and knew how special it was for me to be able to do this. The whole rest of the game people were recognizing me. I told them the story of how my wife won the contest from Wing Stop, and selected me to throw out the first pitch. I took pictures with people and shook hands with fans that shared the same dreams I had in my backyard as a kid. The whole week before that day was incredible. That day was incredible. Those five seconds of fame were incredible. 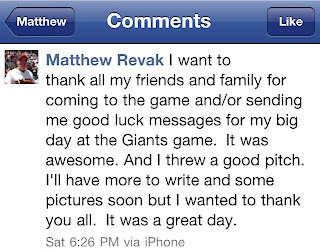 The dreams of a kid who grew up a huge baseball fan came true that day I had my Giant moment.